Finally a vacuum tough enough to tackle rocks and debris! Originally designed for fast, shovel-free removal of rock during landscape renovation projects, the RockVac is proving to be the world’s most versatile landscape and construction vac. In virtually any wet or dry application, the RockVac is capable of sucking up rock, wood chips and shavings, sand, gravel, leaves, compost, mud, sludge, glass and debris. The possibilities are endless. By vacuuming instead of shoveling you can fill a 5 cubic foot wheelbarrow in less than 3 minutes! Two people and a RockVac can do jobs better and faster than jobs normally requiring 5 or 6 people the old fashioned way! Increase the number of projects per week without adding labor. Throw away the shovels and start using a RockVac today! It’s not just for rocks! The RockVac has proven itself to be the go-to alternative small vac. By adding different options, the RockVac transforms into a utility vac with capabilities of moving more than just rock. Products being moved with the RockVac include: seed, feed, small grain, fertilizer, peanuts, black walnuts, fertilizer, turkey manure, and wood shavings. Specialty RockVac with a Galvanized Tank on a Skid Mounted frame. 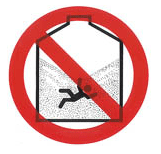 Entering a bin, silo, tank or other type of storage structure is hazardous. You can suffocate and die from the materials stored inside these structures. There also may be explosive, harmful or poisonous gas or dust in the air. A vac operator and all other personnel assisting should strictly adhere to the procedures outlined in “Bin, Silo, and Tank Entry Procedures” before entering a storage structure. For additional details regarding these procedures, reference OSHA Standards. When entering grain tanks, bins, and silos, also follow these tips – “Bin Entry Do’s and Don’ts” from the Kansas Grain and Feed Association’s Safety, Health and Environment Committee. Before using your vac, it is your responsibility to read, understand and follow all of the safety instructions in your operator’s manual. Also make sure that EVERYONE operating or near your vac understands and follows all of the safety instructions in the manual.